The SAA following the change of Management has decided to follow the crowd and join in the merry money process of organizing a mass market race. And just to up the ante, they came up with one special race just for the ladies and to tie in with International Woman month. 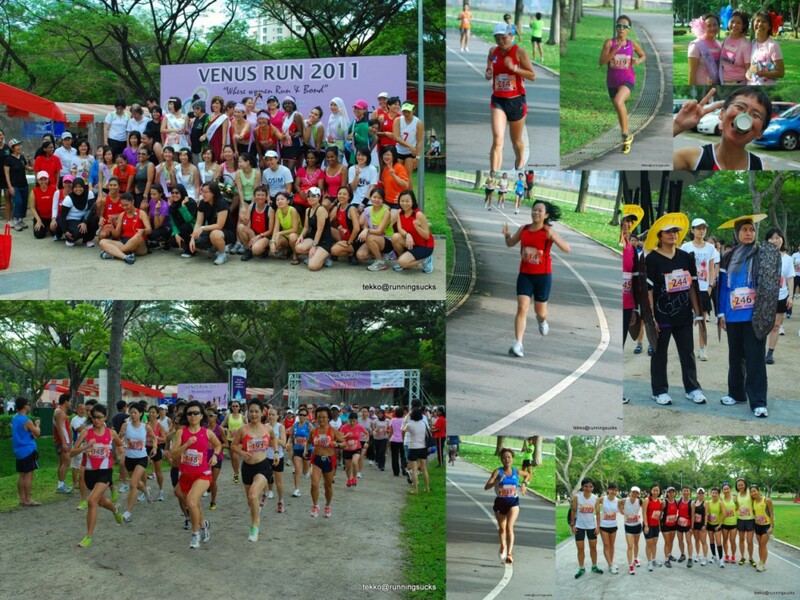 So volia – the birth of a new race: The Venus Ladies Run; a 5km team event comprising of 3 ladies per team and with a catch. The fastest team doesn’t win! So I found myself at Bedok Reservoir where M and her friends have registered as a team. It wasn’t really a big crowd. The SAA has wisely capped the number of teams at 150 teams which means in total there should be not more than 450 participants and perfect for the teeny weeny little track at Bedok Reservoir. To add to the fun, there was also a fancy dress competition so we had some sporting ladies coming in all sort of costumes including these 3 who walked away with the top prize. The race started slightly earlier than the official flag off time of 8.30 am. As usual, some guys choose to run alongside their darling but majority of the other half prefer to walk around, gawk at the chiobus and take pictures. And this klutz here was salivating at all the chicks on display that he forgot his photo taking 101 and forget to change 1 setting and destroyed all the running pictures:( Anyway, here are some of the more passable photos. The race was won surprisingly not by the elite team of Vivian Tang from Athlon but an ‘oldies’ team from HDB with a combine age of 164. The winning team is actually determined by a combination of the total time and the total age of all the runners in the team. So Vivian and company got pushed down to 2nd whereas Club HDB with a total age of and a total time of 1hr 22mins came in first. Score one for the oldies! But I think all the ladies enjoyed themselves. Not only do they have plenty of space to run, enjoy the camaraderie and bitching that only women are capable of, but like all the other ladies race, they managed to lug home 1 big solid goodies bag.